Got the MEK6800D2 somewhere in the early eighties. Played with it quite a lot. The last thing I did was to configure it to take a 2708 (by adding wiring for the -5V and +12V lines) so that I could read the contents of my two Tiny Basic EPROMS. 2015-08-29: I dug it out again, unplugged all the chips and cleaned the pins, and plugged the bare basics in again. When unplugging, pin 1 of the 6800 broke off, so I soldered the 6800 into a socket. No joy, however -- nothing on the display. Some time with the logic probe told me that the R/W line is not toggling. Looks like the monitor code is being executed and that the processor is trying to write to the RAM and the PIA but with the R/W line stuck high that's bound not to work. So I ordered a replacement processor from eBay. 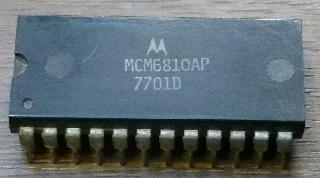 The MCM6810 is a 128 byte RAM chip. Four of these maxes out the D2 with half a kilobyte of user RAM. A thousand-and-a-bit kilobytes makes a megabyte, and a thousand-and-a-bit megabytes makes a gigabyte, and if someone gives you a one gigabyte memstick right now you'd probably throw it away because it's too small for practical use. For illustration, the white text in the paragraph above is 128 bytes. The MEK6800D2 has a kind of a screwy memory map. Or at least, the address decoding is very basic. The top three address lines break the memory space into eight 8K blocks, with the ROM or the RAM or whatever repeated inside that 8K block. The peripherals are mapped in the 8/9 block which allows a maximum of 32K contiguous RAM -- a lot at the time, but somewhere around 1995 they managed to squeeze that into one chip. Somewhere I recall seeing a morse code keyboard based on a D2 but I can't remember where. 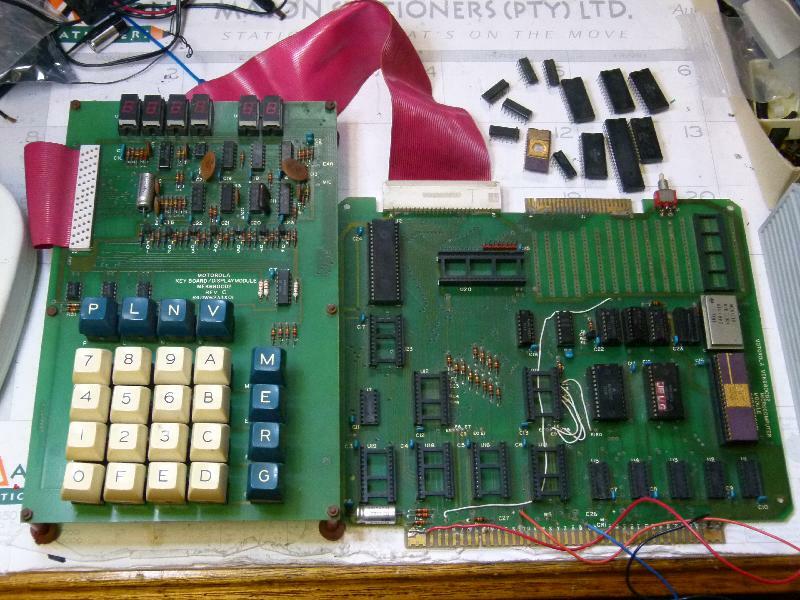 MEK6800D2 Manual here or over at Al Kossow's bitsavers. Nice pictures of a D2.